If you would like a stress free family holiday where you can truly relax and let the kids roam free this is the place to be. It’s a paradise and a magical place for kids and at the same time does not hold back on its luxurious accommodation, food and quality of service. 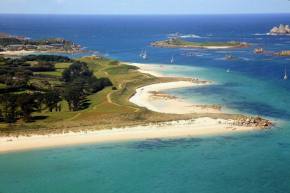 Tresco Island is only 30 miles off the coast of Cornwall but truly feels like you have gone abroad. The sandy beaches on your doorstep and clear blue seas seem too good to be true for the UK! The climate is such that Tresco is home to the famous Abbey Gardens – where you will find species here not seen anywhere else on the mainland. If you fancy hiring bikes, Abbey Gardens is well worth a visit. And so are the castles – why not take a ride along the coastal paths to Cromwells 17th Century Castle and a little further up hill is King Charles Castle. A great adventure for the kids – made easier with the bike shop hiring tag-alongs and kids accessories too! As well as bikes you can also hire boats, windsurfs and kayaks from the sailing club. And if you need some help getting around you can also hire a golf buggy from the island office for the duration of your stay. If all this activity and fun on the beach is too strenuous then you can always retreat to the leisure facilities. The flying boat club is right on your doorstep from your accommodation. 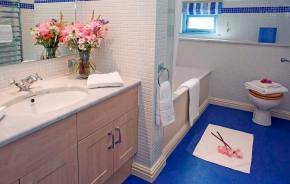 You can choose from the gym, spa, sauna, Jacuzzi, tennis courts and indoor heated pool. You also have access to the golf club for your stay – included in the cost of course. 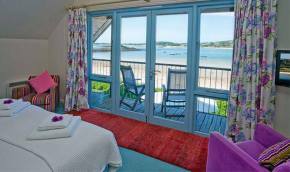 The flying boat cottages are on the Western side of the Island and have amazing views over to Bryher Island. If you fancy exploring a little further off Tresco there is an inter-island boat service that can help you check out what else is out there – an amazing trip around some stunning scenery. 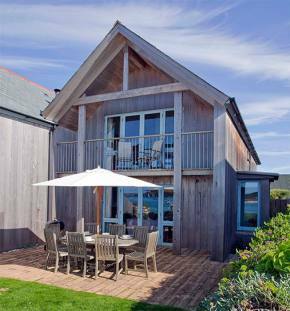 Inside the cottage there is a fully equipped kitchen which means you can stock up on food from the store and delicatessen which sells local produce, Cornish and West Country produce ranging from Tresco beef to Newlyn fish and Scilly ice-cream. The delicatessen has a large selection of cheeses and an in-house bakery producing fresh bread, hot pasties and croissants. There is also a dine in option where you can select a chefs special and pop it in the oven to enjoy in the comfort of your beautiful cottage, Top class food without having to leave your house! If you would rather eat out there are a number of options which you will enjoy. The Ruin Beach café is really relaxed and has a great atmosphere, they have received the Gold Standard in the Conde Nast Traveller magazine in its listing of favourite hotels, restaurants, bars and beach clubs around the world! So you know you are in for a real treat. The café is open daily from mid-march to early November and has kids options. It’s a great place to sit on the terrace with a glass of wine whilst the kids play around the beach in front of you or for your early morning coffee and buffet breakfast. The views are stunning and you’ll feel very chilled! The Flying Boat club restaurant is on your doorstep and is open 3 times a week for main meals and daily for snacks and drinks and lunches. Make sure you make a reservation for dinner as this is a popular option. The New Inn Pub serves award winning food and beverages. The pub has been awarded 4 yellow stars and a Gold Star Award from The AA for quality and service and an AA rosette for food excellence. You will get a fantastic meal here and again, a great atmosphere with regular live music and beer and cider festivals during the year. 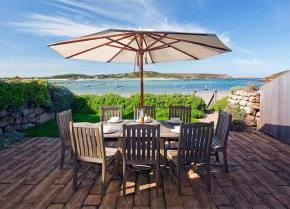 Just don’t miss the Tresco surf and turf – Bryher lobster and Tresco chargrilled beefsteak! For your information, the store on the Island also sell a wide range of baby products so you don’t need to worry if you have forgotten to pack the wipes, or run out of baby food and nappies. 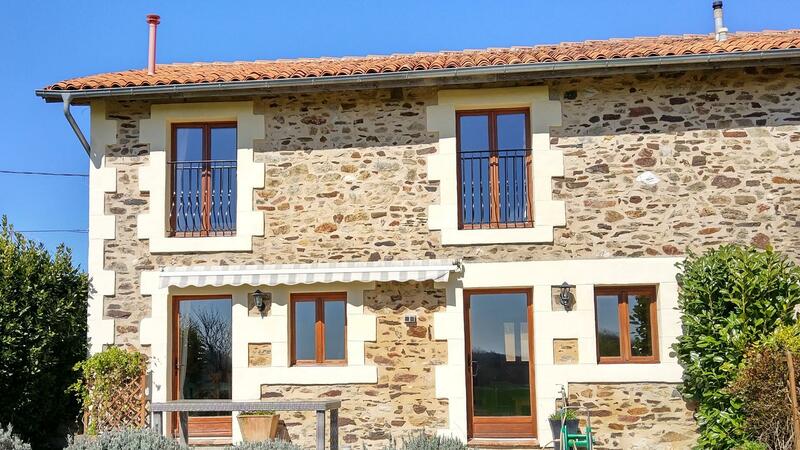 These cottages have 3 bedrooms, a master double, plus 2 twin room. Some of the properties have extra sofa beds so please let Tresco know when you are enquiring, of any additional requirements you may have. 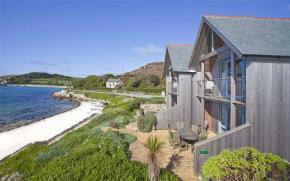 The cottages are in a fantastic location, you can be down by the beach in seconds and they all face out to Bryher Island. 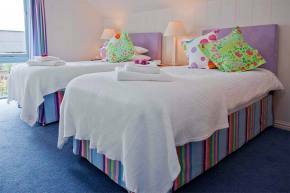 The interiors are beautiful – all so well decorated, including some fantastic artwork of the Cornish coast. On the ground floor you will find a dining room, lounge and separate WC. There is also a fully equipped kitchen with range-style cooker and American fridge. 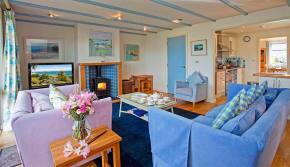 The large lounge has a log burning stove, large flat screen TV and excellent sea views from the patio doors. Upstairs you will find the very spacious Master Bedroom with en-suite which has floor-to-ceiling windows so you can see those stunning sea views. The second and third smaller bedrooms face the back and each has twin beds that can be zipped together. Some of the cottages have a downstairs snug/TV room with a sofabed for two; and some have a separate dining room instead – so again please clarify when enquiring. Outside there is a magnificent terrace with table and chairs and a small patch of lawn so you can enjoy the views with a bit of al fresco dining whilst the kids happily play! Babysitting available with prior notice.